Imagine that you are surrounded by a tall fence and a locked gate. You can look through the fence and gate and recognize familiar activities and interests that you once had. Consider this boxed-in perception as a concept of aging for some persons. What can you do to set yourself free from the box when you retire? The solution is to push against the gate to discover that you can budge it. Keep pushing as a way to set yourself free. When you reach retirement age—whatever it is for each of us—do not focus on your age but on other options open to you. I knew a woman who whenever we met would say announce her age. She restricted her life by focusing on her age. Despite a little slippage in recall, you can retrieve what you have forgotten by searching diligently, but this effort is both time-consuming and frustrating. Instead, consult the calendar or day-planner to find the notation of a date, or call your luncheon companion to ask, “Is our lunch today or tomorrow?” Enter phone numbers that you use frequently into your personal notebook. Note upcoming events on a calendar and consult it every morning. Consider the problem of misplaced keys. Putting the keys in a variety of places when returning home can cause the problem. By always placing the keys in the same location you solve the problem. Use crossword puzzles in newspapers or books to stimulate your brain. When you feel frustrated set the puzzle aside for a short time. When you come back to it, the needed word may burst from your mind. You have regained what had seemed too hard or impossible to retrieve. Make an effort to play games with friends. Invite them for coffee and games, such as Scrabble or Monopoly. Compete to win. Stretch your mind. Strive to be a champion. Try to reduce the amount of time you are alone at home. Being with others provides another channel to keep your mind involved. Try to be with optimists. Dancing, swimming, table tennis, exercise classes, and other physical activities are helpful. Walk near your home once or twice a day. Use a bus service if it is available. You are in charge of you. Make certain things happen rather than wait for someone else to suggest an activity. When you initiate an activity involving others, you are helping them as well as yourself. Learn something new such as embroidery, knitting, crocheting or tatting. Learn computer skills or a new language. Try gardening. Paint, or learn to make pottery. Try a different book genre. Just because you are older does not mean you have to shy away from anything new. I heard of a man who baked his first pie after he retired. It takes courage to attempt something never tried before. The retirement years are a genuine part of life. Do not accept the idea that when your career ends, life also ends. Your retirement years will be many more than your ancestors had. Use these years to your advantage. Another realm of life is volunteerism. If you still drive, Meals-on-Wheels needs drivers. Public libraries may need helpers to shelve books or read to children. Churches and schools may need volunteers. You could volunteer in a hospital, guiding patients and visitors. Many new adventures await you! Many agencies could not survive if all helpers were paid. Volunteers enable agencies to continue serving the community. The way to keep youthful regardless of your chronological age is to dare to try something new. Have a reason to get up in the morning. Retirement years can be the time of discovery and excitement. I knew a woman who began piano lessons as a senior just for the fun of learning something new. If your career developed something special in you, share it with others–being a graphic artist, teaching photography, or whatever your talent is. An accountant can help taxpayers with income taxes. Executives can help a new business grow. Share your hobby or travel stories. Never say, “I am too old to do that!” If a toddler could express his feelings in words by saying, “I can’t walk very well. I’ll quit trying. Sitting is good enough for me,” we would regard that attitude as abnormal, lacking enthusiasm and optimism. Have a normal toddler’s zest for living..
Visit a senior center and request a list of the month’s activities and programs. The variety may surprise you by offering interesting programs. Visit museum, which offer culture, history, and information. Consider writing your life for relatives and friends, not for publication but to create a meaningful memoir for your descendants to read. Describe a house from your past and your childhood toys and games. Describe your school. Did you have ride a bus? These details will be precious to your descendants. If you are near a college or university with courses in special education, you might enroll to learn sign language or transcribing braille. Volunteer to run errands or shop for groceries for the homebound. Volunteer to transport patients to dialysis or cancer treatments. I wish you countless adventures with spectacular experiences as you travel through the years of discovery. 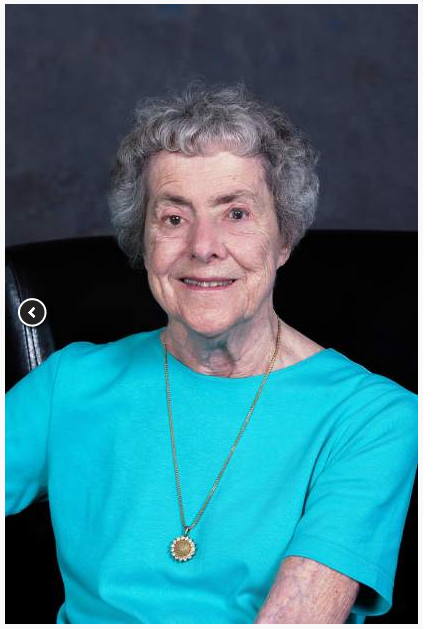 Dr. Grace D. Napier (emerita professor of Special Education, University of Northern Colorado) was born blind in 1922, enjoys reading and writing, has written five books and has used ten dog guides over seventy-five years.